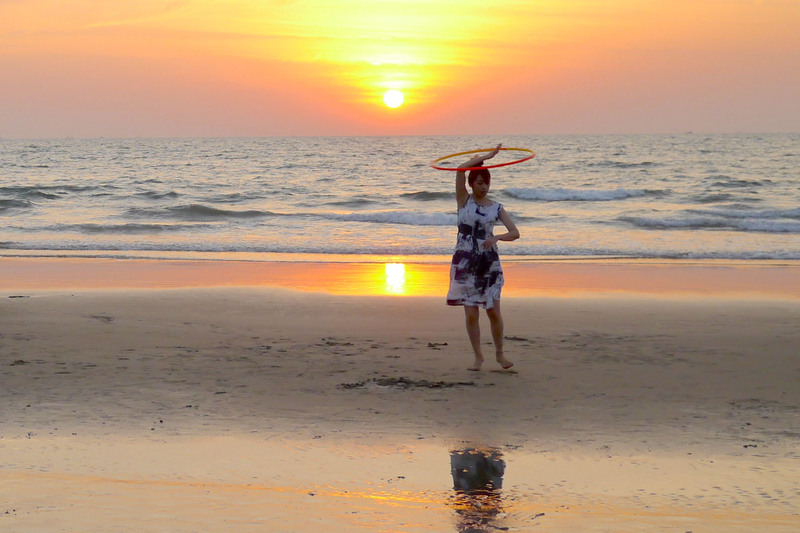 Join our Yoga & Beach retreat in Mandrem, a quiet pristine beach village in the north of Goa, only a twenty-minute (beach) walk from bustling Arambol. Do you enjoy a group vibe but also love having personal time to do whatever you please? Then this retreat is for you! You can start your day already at 7 AM with a one-hour Vinyasa yoga practice on the beach, or at 8.30 AM with the 1.5 hour Vinyasa practice in the shala (or take both!) followed by a healthy, tasty vegan communal breakfast in the beach side restaurant. We meet again in the late afternoon for a yin yoga session followed by a vegan buffet. Kirtan, heartsong circles, or a lecture on Vedanta or yoga philosophy will be added to the evening program for those interested. Visit the night market in Anjuna. For a little extra charge, enjoy a swim in the pool at one of the neighboring luxury resorts. 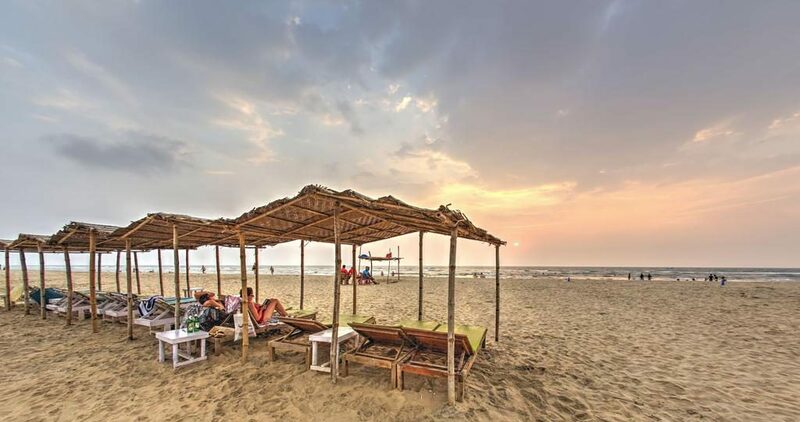 Arambol with its hippy vibe and markets, is just around the corner. We are holding our first Dhrupad classical singing retreat in the charming, historic and famous arts town of Woodstock, nestled in the foothills of the beautiful Catskill Mountains, two hours north of New York City by bus or car. Join us for five days of intense music practice, in which the art of Dhrupad singing will be taught by master musician Pandit Nirmalya Dey. Pandit Mohan Shyam Sharma, one of India’s leading Pakhawaj (double headed drum) players, will give instruction in the basic rhythm patterns used in Dhrupad music. The workshop will be open to a limited number of participants to ensure an intimate setting, with room for individual attention. Men and women will receive separate instruction, except during the early morning practice when we will sit together. Open to all levels although some experience is recommended. This class is supported by flowing vinyasa sequences, chanting, breath awareness, alignment exploration, hands-on assistance, relaxation and meditation. Prices: Trial class €5; single class €15,00; 5x class €65,00; 10x class €120,00. Yogasalon is per January 25, 2016 temporarily closed as Lilian is traveling and studying abroad. Thank you for your interest. Please sign up for the newsletter so we can inform you when our courses and events start again. In the Basic class students are taught “how to do” asanas as well as how to make use of props. The Basic Class provides the underlying structure to help a student to enter into an Open class intelligently and safely. Intermediate and advanced students will also benefit from exploring the alignment essentials presented in these classes. Nada Yoga; The Yoga of the Voice. An introduction to ‘Yoga of the Voice’ through Dhrupad, an ancient form of Indian classical music, in early times only performed in temples and courts. Accompanied by the vibrational sounds of the tanpura and under the guidance of professional vocalist Marianne Svašek, you will discover the transformative power of your own voice. Singing, listening, tuning in, experiencing depth, space, movement and finally silence… silence in sound. Marianne Svašek teaches Indian classical singing at the Rotterdam Conservatory and has been under the tutelage of her late guru Ustad Zia Fariduddin Dagar (1932-2013) for over twenty years. She is an award winning worldwide performer of classical Indian vocal music and one of the few women even in modern times who practices the art of Dhrupad up to a level of mastery. Marianne Svašek will be accompanied by Nathanaël van Zuilen on the Pakhawai. Price: €60,00 includes lunch and admittance to the concert in the evening.